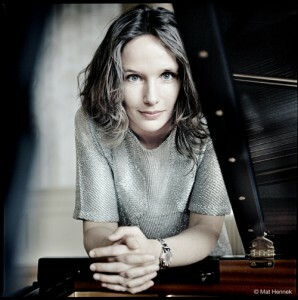 Tonight’s episode of The Music Room features French pianist Helene Grimaud. She is currently playing both Brahms piano concertos, along with other works, during her 2013-2014 world tour. Specifically, Helene will be appearing with the Philadelphia Orchestra Dec. 5 – 8, playing Brahms Second Piano Concerto. We had a great conversation about her interest in the music of the German Romantic movement, in particular that of Johannes Brahms; some of her other recordings; her approach to music; and the Wolf Conservation Center she founded in New York state to help with both education about conservation and wolves’ role in the environment and with breed and release programs. The podcast edition includes more conversation than we were able to fit into the radio version of the interview. Interview with Helene Grimaud (Recorded 10/25/13; original broadcast date: 11/26/13; host: Mandorichard). 31:09, 29.9 MB. Note: the version uploaded here contains excerpts from the music tracks used in the broadcast. We have included more of our conversation in this podcast than originally aired on WVUD.